Dental Month is Coming-Why is it so Important? February is National Pet Dental Health Month-but what does this mean? Many clinics will offer promotions or discounts during the month of February. We want to make sure pets are getting dental procedures as recommended to to keep your pets healthy and comfortable. Why is dental health so important? Unlike people, most dogs and cats do not brush their teeth daily or go to their dentist twice a year. So what happens when they have an issue in their mouth? Often if the pet is not showing symptoms the issue will brew until it becomes a bigger deal like a an abscessed tooth. And pets are good at hiding their symptoms. But we want to keep our pets healthy and comfortable, so we recommend regular dental exams to try and catch problems before they become a bigger issue. Untreated dental problems can cause infections not just in the mouth, but the infections can spread elsewhere. Untreated dental disease can cause your pet pain when they eat, chew, or play. During dental exams under full sedation we can often find problems that weren’t evident when the pet was awake. We recently sedated a dog for radiographs for another issue. 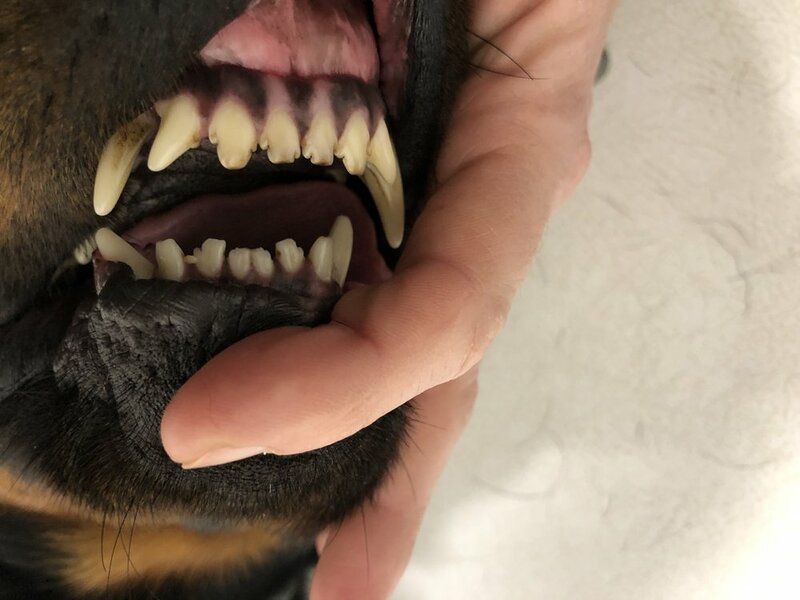 We knew this dog had an overbite, but what we didn’t realize was the severity of the issue. Once the pet was sedated we could actually see that she had punctures in her soft palate from the lower incisors! Ouch! So now we will remove these incisors so they do not cause her continual pain. Remember dental health is as important for your pets as for us!